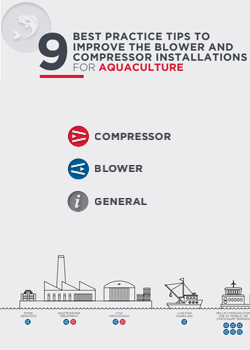 These 9 best practices will help you set up, manage and maintain your blower and compressor installations, greatly contributing to your fish farm’s increased performance. Which factors deserve your special attention? How can you improve your performance in the easiest and most efficient way? Read our 9 best practices related to your system’s general performance as well as your blower and compressor installations, and give a well-deserved boost to your fish farming operations!